Card of the Day ~Let Go Of Fear…Now~ Archangel Michael says that fear is the only thing interfering with your happiness and plans. He wants to show you how to release any worry or dread so you can feel safe and secure. This card indicates that you’re ready to let go of control issues and trust that everything ultimately works out for the best. 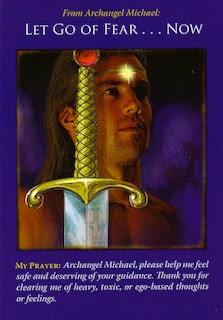 ~Prayer~ Archangel Michael, please help me feel safe and deserving of your guidance. Thank you for clearing me of heavy, toxic. Or ego-based thoughts or feelings. So many of us find it difficult to let go because we feel if we are not controlling the situation then everything is going to fall apart. Once you call on Archangel Michael to help you, you need to trust him…have faith that he’s got this and everything will turn out just the way it is suppose to. There is more than just one outcome to a situation and Archangel Michael can see all of them. Focus only on positive things because you are creating the outcome with your energy. I pray you have a fantastic day. I love you all!